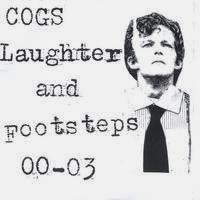 It was around this time ten years ago that I released my debut album 'Laughter and Footsteps'. This labour of love (which is what it truly is) contains around 40 tracks of home recorded madness. 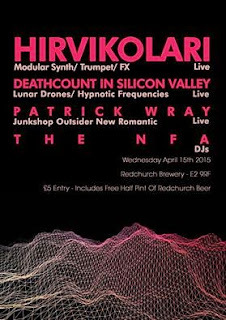 Most of the music was recorded on a Fisher Price tape recorder with no overdubs (cue blizzard of tape hissssss) The tracks were culled from a series of CDR albums I recorded between 2000 and 2003 that were given out to a small handful of friends. They had titles like 'The Hospital Recording Contract', 'Living in the Eastern Block' and 'The Beatles Discover Stockhausen'. Great titles huh? In 2005 I decided to take what I thought were the strongest tracks from these at that time and put together a compilation. It was billed as an 'anthology', but I now consider this to be my debut album. This was released under the band name Cogs and featured billions of ideas conveyed through badly played instruments, badly recorded on technology that was barely fit for purpose. And yet, I believe something special occasionally shines through. The tracks that people remarked upon liking most were 'Hairstyle', 'Atoms' in Me' and 'A Game of Ping Pong'. My personal favourite is the no-fi popera 'Rollercoaster Heart Saga' which I hope to re-record at some point. A few people liked it. Irwin Chusid at WFMU and a few others played it to death and a couple of good reviews came in. This may not be the best album ever made, but so far it is the best one I have ever made. Make of that what you will. Two other Cogs albums followed 'New Primitive' (2008) and 'Afternoons'(2010) (which was in part culled from the same material as L&F) before calling time on the Cogs project at the end of 2009. Splitting up the band when you are the only member is just as painful as when there are others involved I found. It was fun to record and liberating to learn that I could make music for myself without much or any technical skill. I am still sufficiently proud of this album to give it another mention here. The album is now out of print (ie I haven't got any of the hundred copies pressed left) but you can still download it from cdbaby or iTunes or stream for free on spotify. I will be releasing some new music very shortly, but until then why not give this dusty old classic a listen. Playing a gig this month with Deathcount in Silicon valley and Hirvikolari.My first gig in about two and a half years.